What a wonderful Christmas celebration we had. My family was all in town, staying at my home, and we had a wonderful visit. The boys -- six of them -- had a wonderful time playing with one another, I enjoyed visiting with my brother and his wife and my parents. We went down to my in laws on both Christmas Eve and Christmas Day, so there was plenty of driving. But, I'm getting ready for our last week of Christmas vacation and preparing myself for our new subjects. Although everything is entered into Homeschool Tracker, I've now got to assign it to Ben. And, I've got to pull out the LA materials I'll be using with Luke to teach him to read -- we're going to follow Sonlights K level LA from a few years ago; it was too slow for Ben at the time, but it will work quite well for Luke, I'm sure. But, I couldn't leave well enough alone with just planning out subjects -- I went ahead and trashed the school room. It had a hand-torn wallpaper treatment from the previous owner that we weren't in love with, so I started ripping the paper off and using water to remove the wallpaper that was under the torn paper treatment. Now comes spackling touch ups and primer. Oh, and since we're pulling all this off, it would be a good time to go ahead and poke a couple holes in the wall to install a ceiling mounted light. I mean, I'd hate to go ahead and prime and paint the walls, only to poke holes in them at a later date, right? So, I think this means our school room will be a mess for a little while. I'm thankful we've got other places to school in the meantime. After a frustrating Friday when Levi would not stay in his crib for naptime, I came to the sad conclusion that -- sniff, whine -- he was going to have to be in the toddler bed. No amount of discipline would keep him from flippin' his little legs over the rail. Last night was his first night in his big boy bed. He actually stayed in bed and feel asleep -- yea, little man! But, today's nap time was another story. From now on, I forsee that he'll have an hour of "room time" that will likely not result in a nap, but will give me the short break I need in my day to either follow up with calls, put my feet up, or ....whatever. I'm thinkin' we're going back to everyone having a quiet room time during Levi's "nap" so that I can resume regular adult brainwave functioning for a short time. Here is video from Ben's first recital. His teacher is sitting next to him. He's playing "Jolly Old St. Nicholas." He got up to the piano and quickly started his song, so I missed the first few notes. Ben was really nervous, but he did so good -- we're all proud of him. We are definitely in a pre-vacation mode this week! We're still doing school, but it is very "light." Read Alouds: We finished Family Under the Bridge. I love it when Ben shouts, "Read More!" Luke was more than able to keep up with the story. We started Father Christmas Letters, but since it is a holiday themed book, we only have a week to read it and it is nonrenewable, so I'm not sure we'll finish. We've been working on Hand of a Child's Symbols of Christmas lapbook. It's been really fun! We'll finish this up next week, put it all together and share it with our family when they visit for Christmas. Readers: Ben is working through Farmer Boy by Laura Ingalls Wilder and one of the Sugar Creek Gang books (I can't think of it's title, but it is the first in the series). I'm finding it hard to get good reading material for Ben at this point (outside school reading), because many of the books at the library are just too wizardy/ fantasy for my tastes. He's working through the Time Warp Trio books again (he read them mostly in 2nd grade and last summer) -- so he is even having trouble finding good books, too. So the Sugar Creek Gang is what we're test-driving to see if it is worth getting the series for him. I'm pleased that it is a Christian series -- hopefully the story line is good. If you have any recommendations for chapter books for an 8 year old boy, please post them! Science: We've done about a week and a half worth of science this week, and will continue to be science-intense next week. We softed an egg shell using vinegar this week to show how important calcium. Piano: Ben's been pracaticing for his recital tomorrow. I'll try to remember to take the camera and post the video. Geography: We're working through a couple Weekly Reader workbooks about geography and map reading skills. Although we've been making maps since 1st grade, I wanted to use these couple weeks to review things like map symbols, reading road maps (interstate and highway markers). I also found a great total free downloadable geography game called Seterra. You can customize it for each continent's name, countries, US states, state capitals, and I think flags, too. Definitely something than can be used with a huge range of ages (including adult). Flashmaster/ Math: We are just using the Flashmaster to re-baseline Ben's progress with math facts since we started using it in September. I'm pleased to say he's improved in his speed and accuracy with all four operations! All his subtraction and addition facts were 90% or better, which was the target. Next week, we'll play some math games with some of our fun dice. double up on science and science experiments, since we got a little behind and since Ben loves it! - We've done pretty good with this so far. We're in week 14 (Calcium), and I'd like to finish this book, which is just three more days of reading and some internet links, too. Very doable! Finish our last SL gr. 3-5 reader: Mustang, Spirit of the West I decided not to go with this book. Ben's reading two other books right now, plus we've got a pile of library books. Make Christmas cookies finally have started this! Re-read The Light at Tern Rock and The Family Under The Bridge and other seasonal books from the library. We've done one of these books. I'll have to look at Tern Rock and see if we can read it in a week. Learn some Christmas carols so that we can go caroling to our neighbors some night. I'm not sure we'll go caroling, but I will at least have us all go over and deliver cookies to our 4 closest neighbors! Finish up our All About Spelling Level 2 and retest with the materials from The Writing Road to Reading We'll finish this on Monday, retest on Tuesday. Re-baseline Ben's mastery of arithmetic on Flashmaster and work through some Challenging Word Problems and math games Flasmaster is done; we'll work through CWP and math games. Work through some geography workbooks that I have and listen to geography songs Forgot about the geography songs, but we've been doing well with the workbooks. I'm posting today instead of Friday, 'cuz this is just so darn cute! Decide if we're going to purchase History Scribe for notebooking Although the pages look great I think I'm going to pass for right now. I've got Startwrtie software and have the ability to make my own notebookpages with room for drawing. Write out sequence of sounds introduced in preETC books and arrange All About Spelling phonograms in this order. I've decided to go ahead and try to use my old Sonlight LA K for Luke. It didn't work for Ben because he was reading prior to us starting the K program. Luke isn't reading yet, and I think it will be a gentle introduction for him. Actually, I suspect that we'll progress faster through this thant the scheduled 36 weeks, but this is a good framework for getting started. Go through AAS and see how I'll teach Luke to read using this program. Done I'm going to hold off initially. When SL introduces vowels, then I'll add in the phonograms. Give Luke an artic test and pull cards for artic. training. -done. We'll gently work on /r/ and /l/. His artic is normal for his age, but I like to work on stuff gently so it doesn't become a problem with phonemic awareness for reading skills. ...that should keep me busy for the next month. First day of school is January 7. We've been planning on making walking-on-water shoes (a la Leonardo da Vinci) since week 9 but I am sometimes just lame with big projects. Oh, I lied -- it was actually week 8 that Ben first picked out this project. Whatever, it has taken me six weeks to carry the monster sized piece of insulation up the 13 steps from the basement to begin our project. The handsaw worked much better than the serrated bread knife. I actually had to just walk away as he was cutting with the saw. It made me too nervous to watch. "Moms always worry. It's their job to worry about everything," says Ben. Not worry, really, I'm just concerned that your fingers might fall to the floor independent of your body. Then we had to cut about 56 pieces of duct tape in incremental measurements. Definitely a two person job. 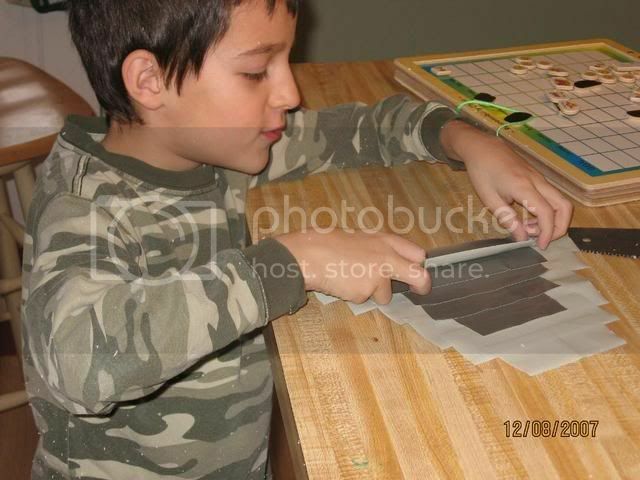 Here Ben is making duct tape pyramids, which he'll use for both his foot pockets and water pockets on the bottom to catch water and help him propel himself forward. 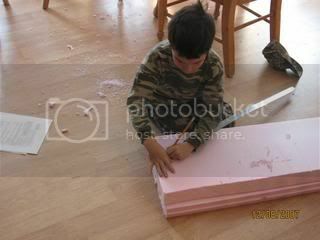 Then I spent the next hour vacuuming up tiny pieces of pink insulation that got everywhere. He didn't actually walk on water, but he did get vertical at least. I'm really excited about this advent season. God's just lined up everything so wonderfully that it is a joy to prepare for Christmas this year. I've done a few things different which has made all the difference in the world: we stopped full-time school the week after Thanksgiving, and now we're just doing "light" school -- science, spelling or grammar, math a Christmas themed redad aloud or two or three. Oh, and Bible study if we ever all all well enough to return, LOL! 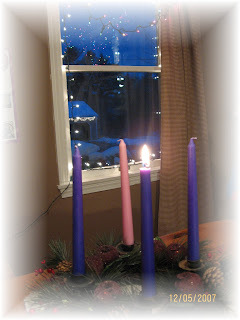 I hope you are enjoying your own advent memories! I've finally stopped being indecisive and purchased Lively Latin for January. After looking at samples (it is written to the student) and viewing the table of contents, I believe it will fulfill our needs and exceed my expectations. Ben has been working through Prima Latina since 2nd grade. We've got the DVD (I couldn't have taught it without them! ), but it is just getting stale -- for me as a teacher and Ben as a student. Given all the options available to homeschoolers, the ability to tailor an education to each student, and the ability to direct our own course as we homeschool, I don't think we should have to have "stale" subjects in our home -- especially in content driven subjects (history, science, latin...spelling might always be stale to some). What is a verb conjugation? So I passed on the good news to Ben: "I've got good news and good news this morning....We're done with Prima Latina...and we're starting a new Latin program in January." Ben: " Can I have more good news?" 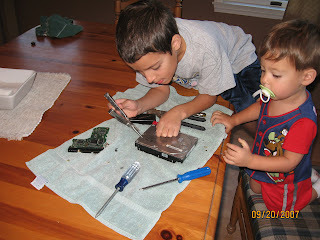 Here is Ben a few months ago breaking into a (broken) hard drive that a friend gave to us. He was very persistent and was rewarded with a set of heavy duty magnets that he enjoyed playing with for a week or so. Levi was his not-so-helpful assistant! We have finished Story of the World pt. 2!!! Woo-hooo! We read a version of Shakespeare's Midsummer Night's Dream, we listened to Jim Weiss retell it, and we'll listen to his Taming of the Shrew on the way to grandma's tonight. I think there is a video that I can get ILL, but that will have to wait. I plan on always trying to expose the kids' to Shakespeare, so our "unit" won't really ever end. Ben finished Singapore 2B reviews, so we're finished with that level. He is doing well, still having a little trouble with fractions (figuring out if 1/12 is less than/ more thn 1/7 for example) and we did a few days of review of 3-digit addition/subtraction with regrouping. So, I printed of an online generated drill page, and first time through, he got 91% accuracy. We have thoroughly enjoyed SOTW, but I must say, I'm ready to move on. I'm preparing now for our first jaunt into US history in January using Sonlight's (SL) Core 3. Because there is some overlap between some of the European explorers and settlers at the end of SOTW, I've decided to not do those now, and we'll learn all about it in SL. About the only thing I'm a little apprehensive about is my ability to remember to continue to notebook and narrate our way through SL. Although it will be easy to do, SL makes no mention of these activities in their guide, so I'll have to add these into the schedule I've uploaded to Homeschool Tracker (HST). I am thinking of purchasing the History Scribe notebooking pages; Ben is becoming more willing to illustrate (woo-hoo!) what we've read, and I want to continue this informal artistic experience for him. So, what will we do for the next three weeks until our Christmas break? double up on science and science experiments, since we got a little behind and since Ben loves it! Complete a Symbols of Christmas lapbook. It looks great! Re-read The Light at Tern Rock and The Family Under The Bridge and other seasonal books from the library. Learn some Christmas carols so that we can go caroling to our neighbors some night. Hopefully, none of this is too ambitious. I've purposely not signed us up for a short extension of our swim lessons in December, and aside from Community Bible Study, we should be able to enjoy a wonderful Christmas season. We'll be reading Jotham's Journey this year, which marks the beginning of our second 3-year period read through of these great Advent books. This is Levi dancing. 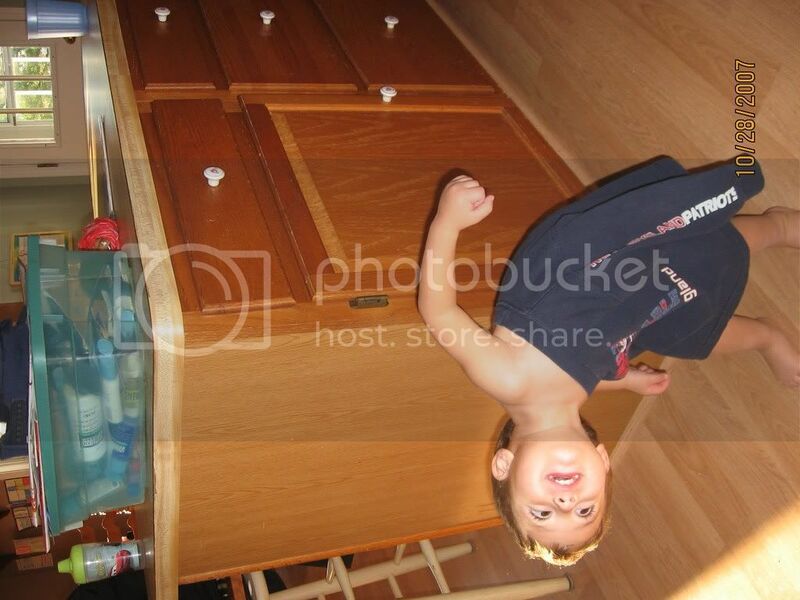 Whenever he wants to dance, he pulls his arms out the neck of his shirt and becomes Tube Top Toddler. Only then will he allow himself to sway to the music. 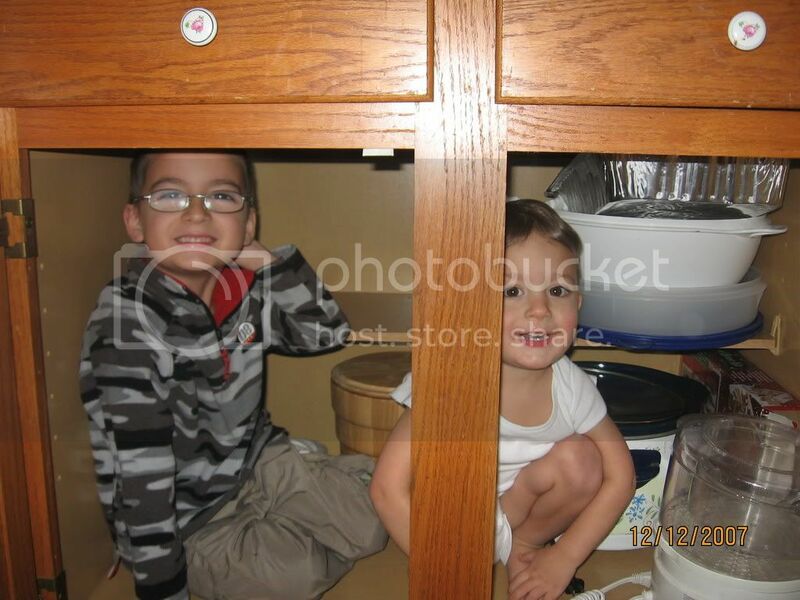 So, when Ben was not even 2 1/2 and I started collecting catalogs from homeschooling companies. I'd do internet searches on our verrrrrrrrryyyyyyyy sloooooooow dial up connection for homeschool curriculum and request catalogs. I don't recall fully how I found Sonlight Curriculum, but it was an earth shattering, life altering discovery. I absolutely love to read, love history (my undergraduate major), and love to cuddle with my son and read to him. Sonlight's rich literature base approach was just the educational method that I wanted for my son. At 30 months old, Ben's education was charted out until he left for college -- all in one catalog. Now, as a first time homeschooler with The Most Brilliant Child in the World entrusted to me, there just seemed like no reason to wait to start his education. By this time, I was pregnant with Budding Brilliant Child #2, and decided we needed to "play" school and get used to a routine. So, I purchased Teach Your Child to Read in 100 Easy Lessons, Explode the Code, Sonlight Preschool, A Reason for Handwriting, and Singapore Math, and we were all set to go! We'd read, read, feed baby, read, sit at the table and do some workbook stuff, feed baby, eat, nap, feed baby... it was great. In between all this wonderful bonding time, I also heard about The Well Trained Mind (TWTM) and borrowed it from our library. As much as I'd fallen in love with Sonlight Curriculum, I fell in love with this curriculum guide doubly so. By the time we'd worked our way through Sonlight's preK twice, I began to make plan to change to the neo-classical model outlined in TWTM. Why? I love the organized nature of the neo-classical model presented by Susan Wise Bauer and Jessie Wise. It just suits my nature perfectly. I also love that the neo-classical model focuses around history. Again, this suits me. Finally, I really agreed with the three stages that a child passes through in their cognitive development; much of this resonated with my professional training (MA in Communication Disorders: Speech Language Pathology). The final key to our educational philosophy involves God. Since one of the biggest reasons for homeschooling our boys was discipling them and preparing them for their role in God's Kingdom, I wanted to make sure that all our studies glorified Him and encouraged us to look for His hand in all that he created. Children in the early elementary years are in the “grammar stages” of learning: they are learning the details of academic subjects – facts, lists, rules, etc. Education should create children who want to learn, know how to learn, and can communicate what they learn to others. Use living books as much as possible. I try to keep these points front-and-center as I plan our year, month and week. I don't always get it all right -- I am very black-and-white and sometimes get stressed out if we stay on a topic too long or don't finish our week's plan as scheduled -- but I do try and more importantly, I pray and ask for God's grace to wash over my mistakes. "Why do you homeschool?" "Don't they miss out on being with other kids and socializing with them?" "How do you decide what to teach them?" "How do you know you are doing a good job?" "Who tells you if you are doing a good job?" "How can you be with them all day long?" This is just a sampling of the types of questions I've been asked over the past 4 years I've homeschooled Ben. Most people ask with geniune interest and curiosity; occasionally I'll run across someone who thinks I'm just nuts and determined to ruin my children and turn them into social and economic outcasts. That is not our plan at all. But, I'm not posting about our homeschooling plan, rather how we got started. It's all my husband's fault. Ben was just a baby, really, when the seed was first planted. Off the cuff once, he said, "You should homeschool. You'd be good at it." My immediate reaction was, "Man, you are nuts!" At that time, I had a stereotypical view of homeschooling and knew only 1 person who was homeschooling at the time. She was nice and all, but I just didn't think it was for me. We moved across country, however, when my Ben was 19 months old. It was during that time that my heart began to soften to the idea. We moved to a more politically liberal part of the country, and I think that the impact of secular and evolutionary influences on my child became more important to consider. So, I purchased a book on one of our favorite date night activities (hanging out at a bookstore after a fun dinner) -- Debra Bell's Ultimate Guide to Homeschooling. It was the perfect book for me to buy, because she held my hand from the beginning questions of "why homeschool" all the way through to homeschooling for high school. Her reasons for homeschooling --spiritual, academic and relational -- resonated with me, and I remember thinking, "Yes, I want that for us!" I even gave the book to my father once and had him read the chapter on "why homeschool" because I just couldn't answer his questions on my own yet. After reading it, he nodded his head in understanding of our desire to homeschool our children. That's how we started...and I'll thank my dear husband forever for his off-handed comment, his encouragement, his confidence in me, and his financial support for us to chart these wonderful waters. A good week was had by all. We've started a couple "new" behavior plans for the Hugs and Smiley because they were being very grumbly and whiny of late. So, far, it seems to be working, which means DH and I are being more consistent enforcing the boundaries we've set. We had our last swim lesson this week. Ben is a solid mid-Level 3 (somehow, he go put in a class with a bunch of Level 2s instead of what I'd requested, but I think it was a blessing in the end, because he improved the quality of his skills and is an awesome floater now!). Luke passed level 1, and will move into Level 2 the next time we sign up for lessons. We studied about the Periodic Table this week and made a cool project to learn about organizing information. 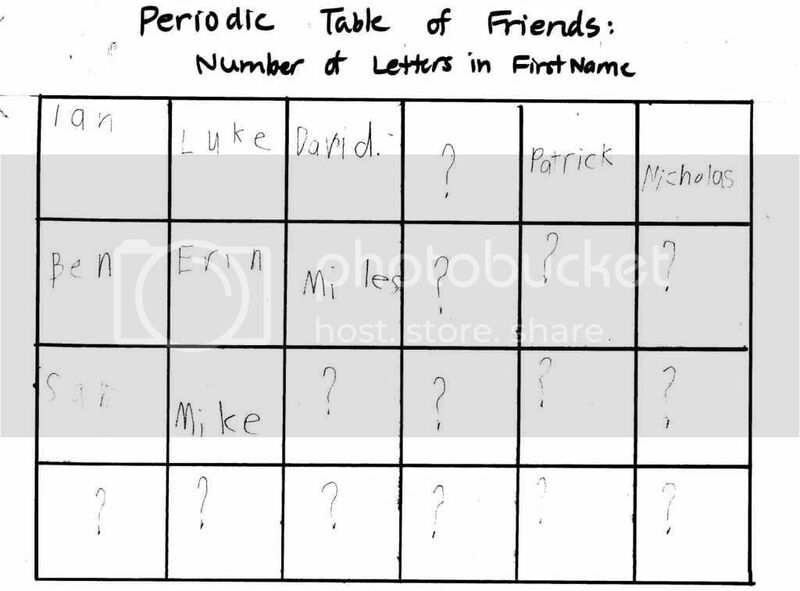 Ben organized friends by their name, number of letters in their name, favorite color, number of siblings and age. Then, we put two of these on a grid and call it The Periodic Table of Friends. All the "?" are for "undiscovered" friends, just like Dmitri Mendeleev did when he started the periodic table of elements. We studied about Queen Elizabeth this week in SOTW. I've decided that next week's Shakespeare unit will be the last one for SOTW 2. The last few chapters of the book contain a lot of information about explorers and the beginnings. Other subjects are plugging along. I'm really, really getting excited for a change in our subjects after the 1st of the year. Our week started on Sunday the 4th with a temper tantrum. Mine. Yes, you read that right, just before we left for church I had a mini-meltdown. My darling DH calmly and patiently said, "I think that you need to have some time away this week. Why don't you take every night this week and do something for yourself?" It was just what I needed. Some time to do things without the kids. I am really low maintenance, so this is what I did: I went to the library by myself to pick out the last set of books we'd need for our history studies before we switch gears to Sonlight. It was fun to browse through the stacks -- even though I stayed in the Children's Room. I got a Starbucks coffee (cinnamon dulce - totally the best) (we finally live in a town with a Starbucks. Please, God, don't move us!). I went to a Moms In Touch prayer meeting. It was an incredible experience, and I hope to be able to go about every other week. We prayed for peace in our homeschools, our children, and ourselves. I went to Walgreens to buy hair color and came home and colored my hair. Thursday I tried to stay home and finish my Bible study ("Mom!...Mom!.." says Hugs from outside my room about sixty thousand times in one minutes. "Hey, close the door and get out. Pretend I'm not here," I say. It finally works). Then Friday my Creative Memories consultant calls and says I can come work on my scrapbook. So, I visit a different Starbucks (two within a 6 mile radius. Heavenly.) and spend a few hours working on my stuff and watching her and her husband help their daughter's First Lego League with final preparations before their tournament on Saturday. In all, it was a great week for me. I do feel a bit refreshed and am so thankful for my wonderful husband. So school. That went well, and our Flip Flop has continued for the week. I'm pleased to be able to start our homeschooling day cuddling with Hugs and enjoying some literature, poetry, and Bible reading. Oh, and history and science, too. It reminds me of our early days of homeschooling and Ben would get a "whole pile of books" and we'd just hang out on the couch for the morning reading. This also gets us back to the heart of our homeschooling and one of our reasons for homeschooling, which was to build incredible relationships in our family. Our history lessons this week were about Galileo and Copernius. We enjoyed a supplemental book from the library Starry Messenger. 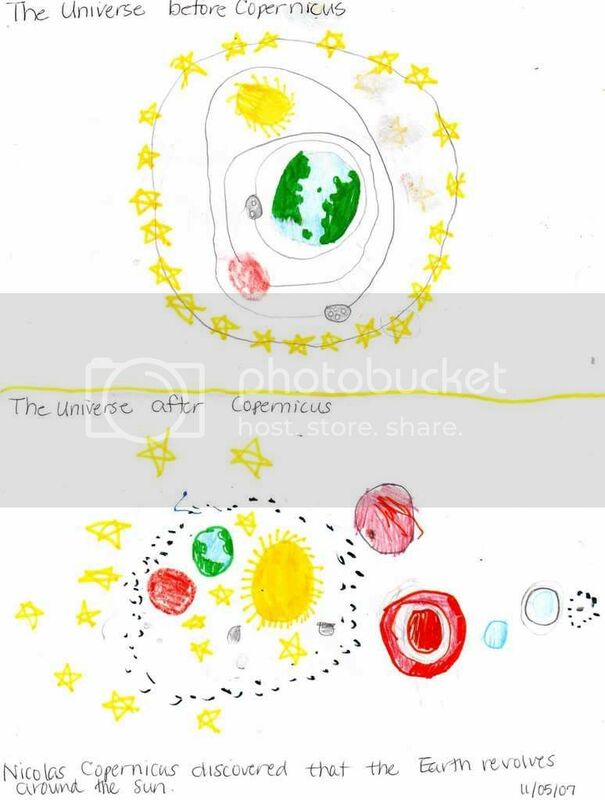 Hugs did a great pre-/ post- Copernian universe drawing for his notebook. We also read through a biography of Marie Curie for science. I really need to kick myself in the behind and do an optional experiment on weeks when there are no scheduled experiments. So, we're going to make some kind of bouncy blubbery thing with borax this week. THIS, my friend, is why we're studying chemistry this year -- bouncy, blouncy, blubbery, rubbery things. Ben hit a lesson on flats in piano this week, and it seems to have really thrown him for a loop. I found an online Quia game to help him name his notes, and plan to make some kind of game for him to practice knowing the name of the notes better. He does an excellent job of memorizing the tune and finger placement of a song, but is struggling with note reading (where I also struggled as well). Red Sails to Capri is our read aloud this week, and it is a wonderful adventure story. I highly recommend it. It is especially a good boy book, as the main character is a 14 year old boy. Our review of Latin was a bit lackluster this week, but I've decided that we're not going to learn a new prayer in Latin, rather we're just going to review our previous learned prayers, the Sanctus, the Doxology, and the table blessing. I've also been mooching this week. I acquired a bunch more books from Bookmooch and PaperbackSwap this week, and I now only have to purchase about 6 books for SL Core 3. Whoopee! What a great service this is -- all you do is pay shipping for the books, and you earn credits everytime you give away one of your books. I'm pleased to have cleared off a small space on my shelves to add in some books I think we're going to love. Well, it sure was nice not to have to pack a suitcase for this weekend! We're done traveling for a while and I'm thankful it was rainy today so that we could spend some time enjoying each other! Next week we're going to tackle the reformation/counter-reformation. I'm still awaiting an inter-library loan about the Lutherans, but even if that doesn't come in for another week, we're going to charge ahead! Science: It's back! Yeah! Ben's has formulated a question and made a hypothesis for his science experiment (with control group). I'm so glad we're back into the science groove. I love science. Language Arts: We're progressing through AAS and FLL-3. We're really only 1 week behind in FLL-3, which is not a problem, because we were scheduled to be finished with it mid-May, and our school year won't end until the end of June. We've been without a reader for the week (but Ben still reads -- he's read 2 Judy Moody Books and 1 or 2 Stink books), but I just got our ILL, Lumber Camp Library, which looks good, but will only last for this week at the most. Then, we'll move on to another horse book, Mustang, Wild Spirit of the West. The Bible memory verse/ handwriting combo has just been pure genius on my part, and I'm glad I've dropped Reason for Writing. I'm also beginning to require a bit more cursive on Ben's other writings as well. I plan on making it mandatory after Christmas. Latin: Plugging away and plotting when to tell DH that I need to go shopping for Lively Latin . I hope to spend some tim updating our year-at-a glance planning grid to flesh out a little more where we are and where we are going. I also need to spend some quality time in front of the TV cutting out Spelling key cards, etc. (really, I must sit in front of the TV to do this or else I'll go insane). I've decided to investigate digital pianos for the new year, instead of paying $200+ for an annual tuning of our little spinet piano. Our friend and piano tuner says it is an OK piano for a beginner, but I just don't want to keep shelling out money for a tune on it when we could get a digital with weighted keys for a decent price (I hope) that would never need a tune, that would have a headphone jack for practice. I've started to look online, and some of them even come in a frame that simulates the look of a piano console. Where am I? What am I doing here? And what are these three (adorable) rugrats doing around me all the time? That is how I felt after DH left for work on Monday morning as I was trying to re-orient myself to my life. My grandfather passed away on Thursday of last week, and in the whirlwind of activity that follows an unexpected death, I was left numb trying to figure out where we were in our school and life in general. I'm so thankful that we had gone to my childhood home to visit for two weeks this summer. Life changes in the blink of an eye; in June, he looked grate, but the cancer must've begun to spread towards the end of the summer. I look up to the mountains does my help come from there? 2 My help comes from the LORD, who made the heavens and the earth! 3 He will not let you stumble and fall; the one who watches over you will not sleep. 4 Indeed, he who watches over Israel never tires and never sleeps. 5 The LORD himself watches over you! The LORD stands beside you as your protective shade. 6 The sun will not hurt you by day, nor the moon at night. 7 The LORD keeps you from all evil and preserves your life. 8 The LORD keeps watch over you as you come and go, both now and forever. As I thought about my grandfather, I realized what a comfort this Psalm is for me when thinking about him: orphaned by his pre-teen years (11 or 12 when his father passed away and he went to live with aunts and uncles), volunteered for the Army (42th Rainbow Division);survived WWII and the European campaign (including being there when Dachau was liberated) and provided (persevering through good and hard times) for four children, who grew up to be successful contributors to their communities (and parents to a really cute/ handsome, intelligent, and fun group of offspring, if I do say so myself). Yes indeed, the Lord did shelter and protect him through all his days and grandpa now dwells in the house of the Lord forever....not because of anything that Grandpa did, but because of what Christ did for him 2000 years ago. I can't wait to see you in eternity, Grandpa. I love you. So, school this week -- and much of last week after I learned of Grandpa's deteriorating condition -- has been survival mode. Still, I am amazed that we've accomplished some great things, though, and hope we can finish up our Renaissance unit next week. History: I just mentioned we're in the Rensaissance. We're using Hand of a Child's Renaissance lapbook. It is going great! We made artist baseball cards this week for Michelangelo, Leonardo da Vinci, and Jan van Eyck. We've learned about what made art in the Renaissance different than art during the Middle Ages (just so you know, I have NO art history background. All you out there who think, "I could never teach my children about art" please know, that you can! The world of knowledge is just a mouse click away...). We've also learned about what makes a Renaissance Man. Ben has picked out what projects ("I want to build something, Mom") he wants to build from this book: Amazing Leonardo da Vinci Inventions You Can Build Yourself (available as a free download at wowio.com). He wants to make walking-on-water shoes and a trebuchet. So, I'm hoping to get some time to go to Home Depot to buy the 3-inch foam insulation sheets we'll need for the water shoes. I've already put DH in charge of the trebuchet. As a matter of fact, DH is in charge of ALL projectiles from now until each boy turns 18. Once we finish Leonardo, then we'll move on in our history book, Story of the World, to the reformation/ counter-reformation. As far as where we are in our Grand Master Schedule.....well, we're behind. But I've got three years of homeschooling under my belt, and I know it just doesn't matter. We're having fun, we'll have more fun, we're learning and that is all that counts. Latin: My5wolfcubs asked if I'd made a decision between Lively Latin and Latin for Children. I think I'm going with Lively Latin. For our needs now, I think the variety of learning activities will be a hit with the boys (Smiles is also learning Latin via osmosis). Basically, I was sold with the word "Lively" in the title. We are, though, plugging our way through Prima Latina, and it is getting better. We took off from Latin this week, and will restart Lesson 18 next week. Language Arts: We've finished All About Spelling's level 1, which was really far too easy for Ben to do, but I am pleased that it gave him a better understanding of the phonograms. I do have an old copy of Wanda Sanseri's Teaching Reading at Home and have used it as an independent measure of his spelling level. I gave him Test 2 and his scored at a grade status of 5.1. This tells me that he is performing at least at his grade level or above, and that I shouldn't be so worried with his spelling skills. However, I will keep using All About Spelling through level 2 because I do believe he needs to have more practice spelling with the phonograms and with the concept of syllablication. My plan now is to finish AAS 2 by Christmas (shouldn't be difficult; we usually do at least two lessons in each sitting) and then let him go back to his ACSI Spelling grade 3 book, which he'll likely fly through. Fine Arts: I've come to group art and music under Fine Arts in my computer software (Homeschool Tracker), so I'll just lump it all together here, too. Art is going amazing well this year. We completed our first unit about the element of lines in art. 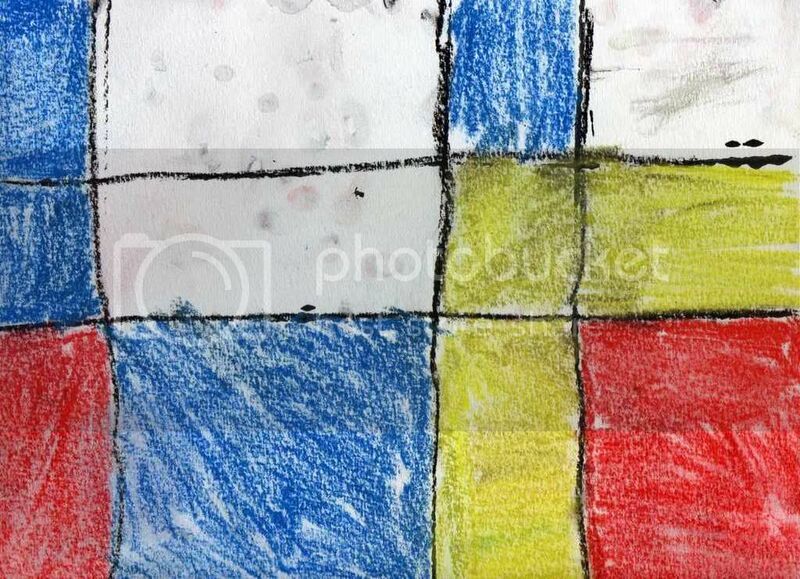 We added four pieces to Hugs' art portfolio, the final being a piece á la Piet Mondrian. Can you tell which is Hugs and which is Piet's? Yes, you guessed right, #2 is Ben's. Isn't it great (it is tempra and charcol on, um, paper, unsigned)? This from a kid who "hates" art. Really, I think he hates art because I have shown impatience towards his artistic attempts. (Patience is a constant prayer for me as I educate and raise up my family.) This year's gentle investigation of the elements of art will, hopefully, capture his imagination and he will be more willing to try art. 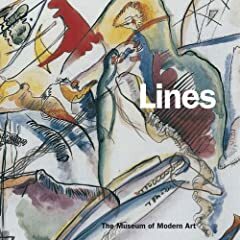 I also found this great book, one of a series on elements of art: Lines, by Philip Yenawine. ...From the mouths of babes! 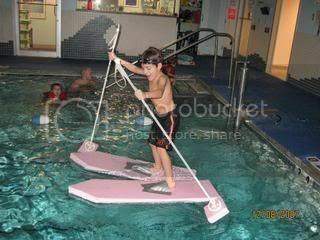 Oops I forgot: Those dynamic warm up exercises I posted on a few back for our homeschool gym? Oh my, I did them for the first time on Friday, and I've been waddling with sore muscles since! (it's Sat. afternoon now). The boys? Not even a flinch from them. Hmmm, I wonder who Homeschool Gym is really for, the kids or me? I'm not even doing a Weekly Report this week because we just didn't do enough to count as school. Well, I take that back. We did plenty of learning, but progress toward the 3 R's was little. We all went to Vermont for 3 days this week, so Monday and Tuesday were mostly me barking orders at Hugs: "OK, do your handwriting now!" "Here's your Flashmaster list" while tried to pack things up and our Tuesday pm departure. Ft. Ticonderoga was a great field trip. Ben's favorite parts were the musket demonstration (the re-enactment British soldier was a wealth of information about the lack of precision and the high luck-factor of the musket) and viewing the assorted items that might be found in the barracks of a fort -- playing cards, ink packets, pipes, darning bobbin (I think that's what you call the thing they shoved into the toes of their socks). It was a beautiful ride town to Ticonderoga; I hope we can explore the Adirondack mountains at some point in our lives. The ECHO science museum in Burlington VT. This was field trip #2 of our trip. The boys really enjoyed the displays and demonstrations. We sat through a lake sturgeon talk. Hugs was the only 8 year old amongst a see of 3 year olds, and did an amazing job of answering questions and volunteering. This is a big deal for Hugs, who is usually shy and won't volunteer much information in group situations. They wouldn't accept my HSLDA teacher ID card as proof of my homeschool teacher status, so I had to pay full price admissions. grrrrrr. Ben and Jerry's Ice Cream Factory Tour: Field trip #3. (daddy got to go with us on this one!) No field trip that ends in ice cream can be a bad one. Flashmaster and my new tracking sheet is working great. I'm seeing measured progress in Hug's skills in the flashcard mode in addition, subtraction, and multiplication. Division is improving, though at a more slow rate than the other three. The pool at the hotel was far too cold to enjoy on Thursday. I swam with the boys a little on Wednesday after our Fort trip, and the pool was nice'n warm; the hot tubs were near boiling. Thursday, though, the hot tubs were fine and the pool was c-c-cold. We (read "I") lasted about 35 minutes. Besides, Levi was starting to get a cold on Thursday, and I didn't want him to get worse. He did anyway. DH (he needs a better blog name...) and I were up with him at 5 am because he was sounding like a seal barking his coughs and had labored breathing and seemed to be having a tempterature (forgot to pack the thermometer this time). We got him cool, turned on the AC and I had him sleep on my chest. He seemed better by 7am, though still barky. Friday during the day he did fine until we pulled up to the Ben and Jerry factory. Then, he had trouble clearing a mucousy obstruction in his throat. But he did finally, and we decided to continue with the tour since he'd returned to his baseline. He was great for the entire rest of the 3 hour ride home UNTIL 2/10th of a mile from home when he did the choke thing again. DH and I thought the same thing and drove to the emergency room. He has croup. He got a steroid injection and is sleeping like a -- ahem -- baby now. Wish I was. I didn't realize how sick of peanut butter sandwiches we'd get in the course of 3 days. We only read through 1 more chapter from Wheel on the School. And, I like it now. The chapters are really long though, and I'm just having trouble scheduling in the time right now. So, there you have it. We did only a couple days of Flashmaster, all our CBS lesson, 1/2 a week of Latin and handwriting; all our science, no history, 1 of 4 grammar lessons.....it is too painful to catalog. But, we had a fun time together and we're all healthy (in a medication-assisted sort of way), so I'll be thankful for what we did and worry about all the rescheduling on Sunday. Not a bad week, all things considered. Over the years, I've gotten a little better about rolling with the punches of life, and not worrying too much about "being on schedule" for finishing our materials within a prescribed time frame. I mean, look at us: we're finishing up what I'd planned to do in the spring of 2nd grade right now, in the beginning of 3rd grade. So this week we started out a few lessons behind in FLL-3. I am still really liking this, for several reasons. It is all scripted out, which I find helpful for grammar. I feel very comfortable with the concepts, but I think I'd be too willing to gloss over some of the foundation building steps that Jessie and Sarah have included in the program. I also like that there is dictation in just about every exercise, so that I don't have to worry about that each week. 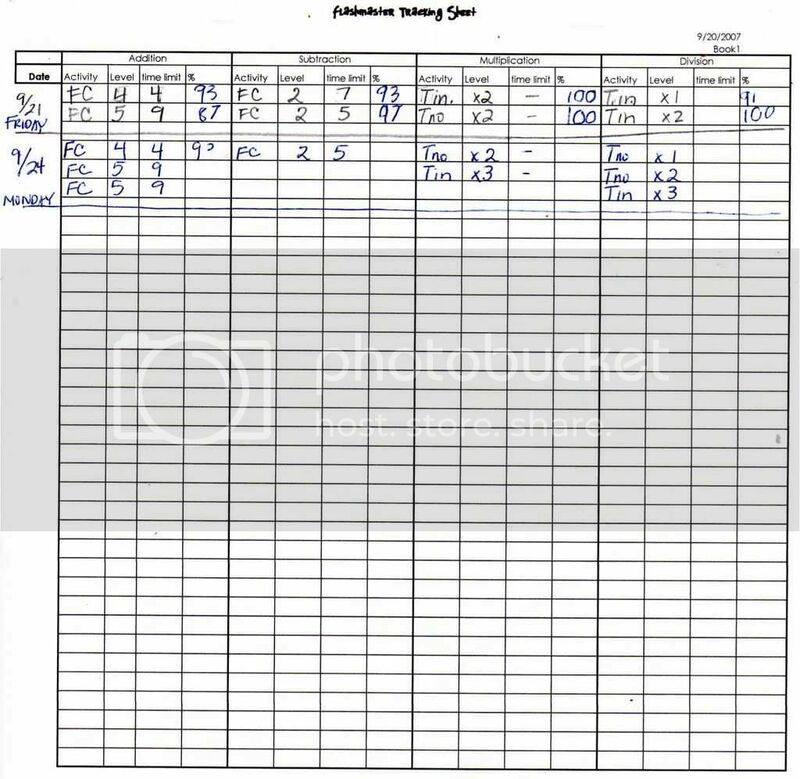 In all, Hugs is doing copywork 4 or 5 times a week: twice in FLL (on average), once in his handwriting, and usually once or twice in science and history combined. I'm also starting to have Ben do more copywork in cursive, so he is getting a lot more practice. All About Spelling is a great curriculum, but it is very teacher intensive. I'm going to try to hang in there for at least the first level, because I think Ben really needs the review for syllabication. I see this as a stumbling block in his reading -- he gets to a longer, unfamiliar word, and just tries to guess at it. He is really an excellent reader (6th grade or higher in comprehension skills), but I suspect he will do even better if he can decode these more advanced vocabulary words. Oh a side note, although I haven't begun Luke's introduction into the world of phonograms, he is usually around when Hugs is working on it, and he is making lots of progress through osmosis! We have finished up the American Kingdoms chapter in SOTW (Ch 32). I had planned on doing the ancient Aztec History Pocket this week, but we only finished two of the activities before he said, "Do we have to do any more of this stuff?" He told me he though the HP stuff was boring ("too much coloring"). I asked him if lapbookins was OK, and he said yes, it was sometimes (I have the Hands of a Child Renaissance lapbook to use in a few weeks). He also said, "I'd rather build stuff, like catapults." So, I'll be sure to revisit the SOTW activity guide and see what I can incorporate into the rest of the year. To address this, next week we're going away for part of the week and taking some school with us. Instead of forging ahead into the next unit in our math books, we'll take the week to do lots more with the Flashmaster and I've found some pages from an old Scott Foresman Exploring Mathematics 2nd grade workbook that will fit the bill to help with regrouping. And, I still have lots of copies of Mental Math that we can work on as well. So, I'm pleased with how next week is set up. Science is going great. We spent Thursday doing two or three experiments with solutions and learned abou solutes and solvents. We really talked over the difference between the solutes (ie sugar) and solvent (ie water) and made several of our own solutions: Crystal Light lemonade, garlic oil and blue water (food coloring). It was a great science week! Here's our art project for the week. We're stil working on learning about lines. Ben was given 4 squares of paper with two lines on them. His job was to make them into a picture. 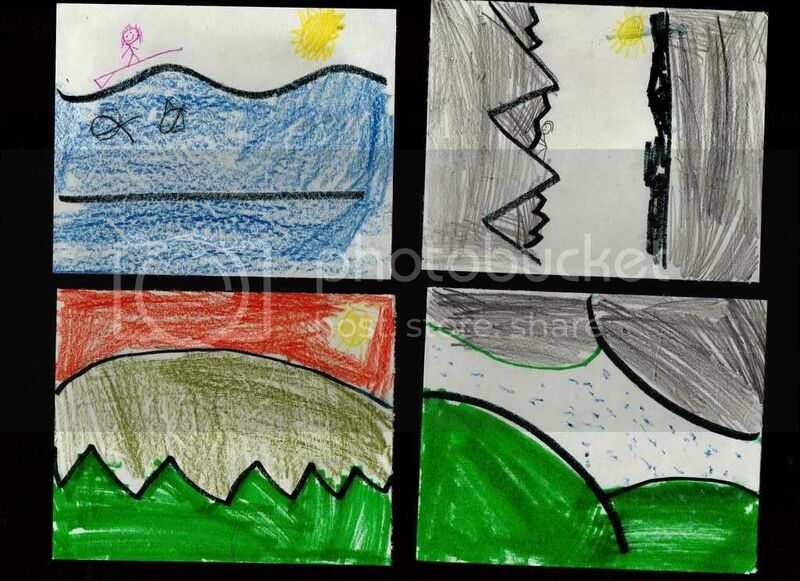 Top left: ocean waves with a surf boarder. Top right: rock climber on a jagged mountainside. Bottom left: the sun setting over a hill with shorter tree covered peakes in front. Bottom right: hills with gray rain clouds bursing forth with rain. The last thing to talk about is Latin. We're 1/2 of the way through Prima Latine,which I've really enjoyed. Instead of working through a review chapter, which is where we left off, I felt is was more fair to review all our vocabulary cards instead. So, each day, Ben did so, and I am impressed by how much he remembered. We weill finish the review chapter this week, then next week begin Lesson 16. This coming week (tomorrow already!) we will be tripping to Vermont and Ft. Ticonderoga, which is about an hour or so south of Burlington. I'm really looking forward to this trip. And, I am thrilled that I thought to call the education office at the fort. They will honor their educator's discount and charge me only $5 total for all of us to come visit. Pray for good weather on Wednesday so we can have a musket demonstration! God's best to you as you do life with him this week! This has been a long week, and I'm too tired collect pictures of the boys' work for this week, so -- I'm sorry to say -- it will just be my narrative of our week . First off: Levi's' EEG came back perfectly normal, praise God! I came to realize something this week: just because I'm not turned on by a book doesn't mean the boys' don't like it (I know, I'm a little slow sometimes). We sat down to do some read-alouds at some point this week, and Ben said, "Can't we read the Wheel on the School?" So, we'll keep on keepin' on with this selection. It does seem to be getting better -- let me rephrase that: my attitude has improved and I'm enjoying the book more, too. I think I've stumbled upon a way to make Flashmaster work for us. We've gone ahead and are compiling a baseline of Ben's math skills. At every level, I've had him do the test feature, and we've written down how many problems he completed in 90 seconds and his percent accuracy. He's completed the addition, subtraction and multiplication operations. He has a nice accuracy record for his addition and subtraction (I'm using 90% or better at this stage), but his speed with these facts needs improvement. So, I've decided that I'll begin by figuring out his average speed at each level and use the flashcard function to help him increase his speed. The flashcard function allows you to set the speed in which the student must respond, from 9 seconds to 1 second (or less, I can't recall). For multiplication, we'll use the random tables function to improve his knowledge of these facts (and I suspect that is where we'll start with division as well). Flashmaster will become an everyday activity that Ben completes, and then at the end of every 6 week term we'll do another test to see how he's improved. This week, Ben is working on memorizing True Nobility by Edgar Guest (thanks to Jessica at Trivium Academy for drawing my attention to this great poem!) instead of R.L. Stevenson's The Land of Nod in FLL3. We'll be extending our study of the Mayan, Aztec and Incan civilizations into early next week because we just ran out of time. So, we'll do our Aztec History Pocket on Monday and on Tuesday read about the Incans. I had Ben work on the Mayan math activity from the SOTW-2 Activity Guide, and he really enjoyed that. I asked him to summarize what he thought of Mayan math, and he said, "Mayan math is really hard" because it is a base 20 system rather than a base 10 system. Then we had our first Community Bible Study on Friday, and I am so thankful that we can participate in such a great program. Luke was not wanting to go into his class, but I sat with him a while and he did fine. "Mom!" he yelled, "I LOVE Bible Study." I am hoping he remembers that next Friday, too. Ben came home, dropped his notebook on the floor, grabbed his Bible and did his first lesson. Cool. We're on step 2 of All About Spelling this week. It is alphabetizing. He knows how to do this at a basic level, but I'm trying to give him strategies to make it more efficient. I suspect we'll stay at step 2 until Tuesday then move on to the next level. Next week we'll be adding in Latin, and at that point we'll have all our subjects scheduled in. On a good day, we can easily finish school before 1 pm. But, those days are few. Ben still needs reminders from me to move from one independent activity to the next, but he is getting better on some days. In the next week, I need to be more purposeful in my routines and help get a routine going for Luke and Levi. We fit in all our assignments this week so that we could enjoy a Friday off to visit with Nana, who came to see the boys from the midwest. We had a lot going on this week! Flashmaster: I love this. After fiddling around with a couple Excel spredsheets from the Sonlight forums, I finally decided to run Ben through a baseline with all the levels in all the operations. So, we're still working through the addition levels, but I plan on finishing this all up next week, since we don't know all the multiplication and division levels at this point. Ben can be competitive, so I'm hoping to use that to his benefit to help him improve his math facts. I've also decided that speed is important, but not vital at this point in the game; mastery of the facts are. Meaning, I want them memorized and I don't want to see him mentally calculating the answer. So, that is what we'll focus on now, and I'll let the time--per-problem remain a little longer at this point (but not so long that he has time to count it out on his fingers!). Math: We're working on addition and subtraction with money. Ben is doing well with it, and I'm pleased to see him picking up the addition of change, We've also started our Challenging Word Problems for Primary Mathematics 1, and I think this will be a great review of the arithematic operations within the framework of developing the reasoning skills for completing work problems. Grammar: I've decided that I don't want Ben to memorize the Land of Nod poem at lesson 9 in FLL3; instead I'll have him memorize True Nobility in the coming week. All About Spelling: We've added this and Ben has now completed his first step in level 1, which is memorizing the phonogram sounds. Chemistry: We read this book through several times. Ben presented Rev. 3:20 to his dad at dinner this week; and we're a little behind in our verses because I washed my mp3 player this week (arrrrggg!). I'm thankful, though, that it wasn't ruined and we can renew its use in our memorization. Things that are not working so great: I feel like I'm never going to remember to do our music appreciation at the end of the week, so I need to rethink when to do this. This week, Community Bible Study starts (Friday). Also, we're going to be in a homeschool gym class on Friday afternoons, which will be great, but it will require me to rethink our scheduling and planning. Last year, school worked best when we did a little bit every day (like doing 4 days per week of science), but I am thinking that science and history might best be worked on just twice per week in larger chunks. I'm not sure how I like the idea of this for science, because it is Ben's favorite thing, and I'd like to give it to him smaller bits that he can digest over the course of the week. I'm also reconsidering our read aloud, The Wheel on the School. It is a bit dry right now, and as much as I hate to quit reading a book, I'm just not invested in storks at the moment. I suppose I'll give it another few chapters and we'll see how it goes. Aside from CBS at the end of the week, I'm not sure what we're supposed to add this week. We will be taking Nana back to the airport tomorrw afternoon, and we have piano lessons as well. I anticipate doing about 1/2 of our school work tomorrow, while she is still here. This was our crazy week because we had a very important playdate on Tuesday and the whole EEG thing on Friday, but I am thankful to God for all we did accomplish. Our addition this week was a Read Aloud, The Wheel on the School; we didn't get too far in it (blushing: 1 1/2 chapters), but there's always next week! I absolutely love starting our day with circle time. Honestly, Levi thinks it is all about him, and honestly it is . We've added Deep and Wide to our repertoire because of its fun hand motions. Levi just stares at the three of us as our arms are flailing all over the place and there is shear delight on his face. That, my friend, is why we do it. A couple times this week, Ben has done his Bible reading after circle time, so I've gotten Lluke to look at a picture Bible, too. So, I think -- all praise be to God, because I've been unable to visualize how to do this before -- we're getting closer to having a morning devotional time. We also started our art program, and I'm happy to say that Day One was a success. I've got picture to prove it. The boys learned about horizontal, vertical and diagonal lines. Luke hung with the big boy and did a great job. Just today we received the Flashmaster. 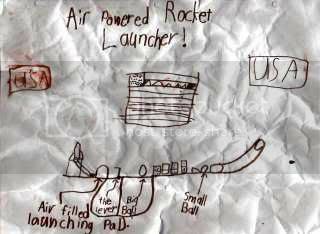 I think it is exactly what we need right now, and I wish I'd shelled out the $50 for it when Ben was in 1st grade. I think it would've prevented all the fear and hyperventilation that goes on when I talk with him about Math Facts. At least we'll get lots of use out of it as the other boys grow into it. I've also figured out how to get grades for his math work (in our Home School Tracker program ), and I plan to give him grades for his weekly assignments. Then, at the end of the week, I can print our a progress note for the principal (a.k.a. Daddy) so he can keep on track of it with me. I also started school with Luke this week. He loves his school books! I'll post separately on what I'm doing with him. Here's Ben's first week of handwriting; we're still using A Reason for Handwriting, which askes the child to copy a Bible verse at the end of the week. Each day during the week, they practice certain target words for practice on different letter shapes and connections. Since we haven't done any cursive over the summer, I was pleased with his final work. We gave it to Daddy to beautify his office. Bible: After 1 day, I realized that I don't like how choppy SL's Bible is. So, we ditched it (talk about perseverance issues, huh?). 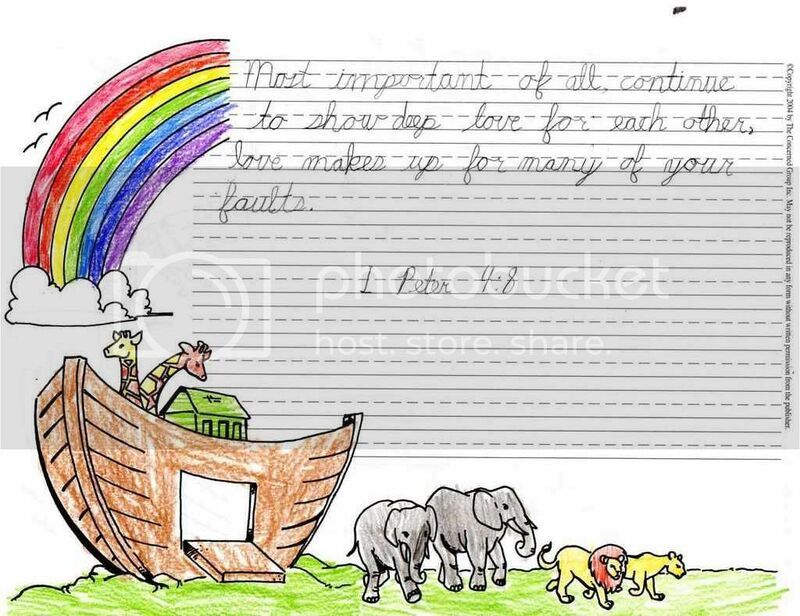 I've had Karyn Henley's Day-by-Day Kids Bible for well over a year, and just never implemented it until now. It is actually perfect for us. We are using it at lunch right now, and everyone is listening it around the table. Also, Ben is reading a proverb a day in his NIrV Bible. I plan on having him do this for the entire year on his own. History: Lancastrians, Tudors and Yorks, oh my! We've opened up our school year with the Wars of the Roses. Boy, what THAT confusing for Ben! But, we pulled through and I am hopeful that in 4 years he'll say, "oh, I remember something about that from before." We're getting close to all the explorers and the renaissance, which I think Hugs will love. Readers: Next up is "B" is for Betsy. Read-Aloud: We kept it light this week with Aesop's fables and Robert Louis Stevenson's A Garden of Children's Verses. I have a feeling that the boys will like poetry in spite of themselves by the time we're through with it. Heeheehee. Math: Confession: I like teaching math. I think I would be good at teaching it with the right student. I think I would be good at teaching Ben if he'd just keep his mouth closed. Math is bringing out all sorts of character flaws in both my oldest son and myself. I was paaaaaiiiiiiinnnnnfully patient during our phonics lessons. I was extreeeeeeeeeeemly patient during handwriting practice. I was verrrrrrrrrrrrrrry calm during our beginning math experience. I can still be patient, if he'd just stop running ahead of my teaching and listen to the entire explanation and direction. Add this to the tears that come during our math fact drill, and I want to go find a yellow bus and put him on it....................................................... deep breathe. OK, I'm feeling better now. I'm learning that Ben is not detail oriented in math at this point, and I'm working with him on being more careful in his work (like not making errors copying numbers) as well as just being patient and listening to full explanations. I think he could do well with math, and I know the hurdle right now is the math facts. Science: "Mom, can I play with the Ein-O balls?" Noeo came with a molecule making kit that I finally let Ben play with this week. He is very excited to start Chemistry, but we're about 2 weeks away. He has to finish reading about wild animals this coming week, then we're done with biology. Grammar: I love love love FLL-3. We've only done 3 lessons, but I think it is great. Next Week: We are adding in art, vocabulary, critical thinking, and music (since I forgot to do it today). Plus, Luke will be starting his school next week, too. I've decided to just take one anthology off the shelf at a time and read through it, then move on to another. So, we are finishing up the Lion Bedtime Storyteller book and will move on to finish up the 20th Century anthology.